Feast your eyes on this juicy cut of beef. They call it tenderloin because it’s the most tender meat you will find. It’s also the leanest, which I love because I can enjoy every bite. If treating yourself to a good piece of meat is not enough excitement, wait until you’ve tried it with a brown sugared crust. The subtle caramalization makes it extra special. To complement the tenderloin, I created a festive fresh cranberry wine sauce that is made with hints of cinnamon and cloves. The spices give the sauce an inviting aroma and will even make a delicious addition to your holiday rib roasts, turkey or ham. To save time, have your local butcher trim and tie the beef for you. 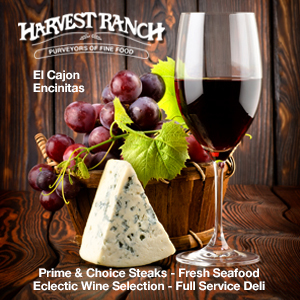 My friends at Harvest Ranch Markets always have plenty of quality meats available. 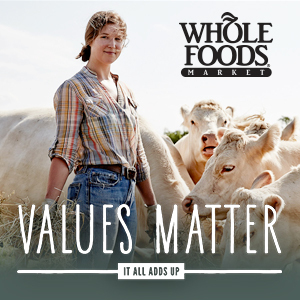 I also love to shop at Whole Foods for grass-fed selections. 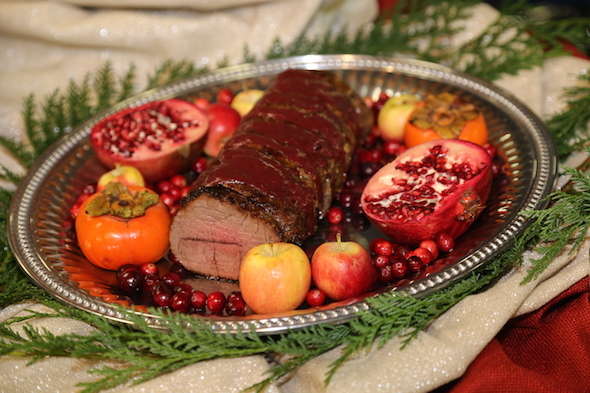 This festive beef dish will make the perfect main entrée for your holiday gatherings. Toss cranberries and 3 tablespoons brown sugar on a small baking sheet. Bake until cranberries burst and release their juices, about 10 minutes. Remove and set aside. Pat beef dry and rub with 2 tablespoons of oil. Sprinkle with kosher salt and a generous amount of black pepper. Evenly distribute garlic and press in. Sprinkle with 4 tablespoons brown sugar. Set aside to allow beef to reach room temperature. Heat 2 tablespoons butter in a medium saucepan on medium-high heat, add shallots and sauté until softened. Add beef broth, wine, cinnamon stick and cloves and bring to a boil until liquid is reduced to half, about 20 minutes. Remove from heat. Carefully remove cinnamon stick and cloves. Add cranberry mixture and puree using a hand blender (can also use blender). Bring sauce to a low simmer. Mix 2 tablespoons butter and flour in a small bowl. Whisk into sauce and continue to simmer until thickened. Stir in 1 tablespoon brown sugar and season to taste with salt. Strain the sauce for a smoother consistency. Cover and set aside. Place a heavy roasting pan on two burners on high heat. (You may also use a large skillet) Lightly coat pan with olive oil. When oil begins to simmer, place beef in pan and quickly brown on all sides, about 4-5 minutes total. Transfer beef in roasting pan to oven and roast until a thermometer inserted 2 inches into thickest part reaches 125 degrees for medium rare, about 20- 25 minutes. Transfer to a cutting board and let it rest for 10 minutes loosely covered in foil. Add remaining pan juices to cranberry wine sauce. Slice and serve. *Cranberry Wine Sauce can be prepared one day ahead and re-heated.